07875-207019 (Crawley, West Sussex) No canvassers. 1995 4WD 2.5l Diesel Auto AFT Bongo 155K miles. Full cooling system overhaul, new head, rad, water pump, thermostat, Cam belt, pipes. Replacement front shaft drive and also 4 new tyres last year. 12 months MOT. Comes with spares, silver screens and roof mattress. £2750. 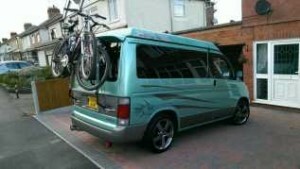 Fiamma 4-bike rack available. Dave on 07974 989553 dave_john_hart@yahoo.co.uk. Warwickshire.